Another Woody Allen film and another conflict of interest for my love of fashion in film and disdain for the man who married his adopted child. Once again, the plot a tad lackluster but the glamorous shots of Los Angeles in the 1930's and reference to the dazzling old school Café Society just marvelous. 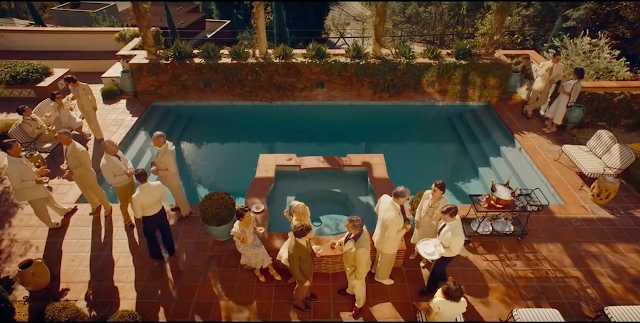 Starting right off the bat with this pristine pool at dusk in the opening scene, veering slightly into Slim Aarons territory. What I wouldn't do for an invite! Enjoy. 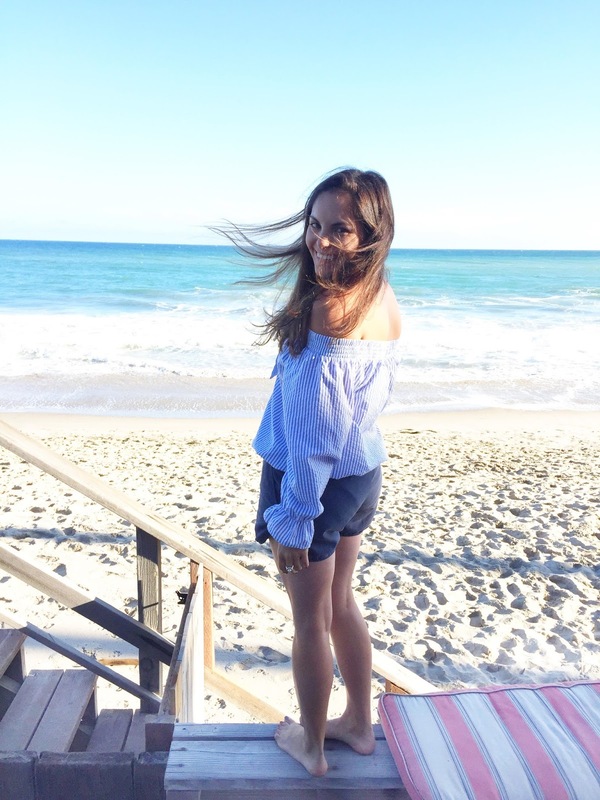 I'm not sure if living in Los Angeles makes me more appreciative of the incredible beach shots, most likely filmed at my favorite El Matador in Malibu, but one thing I can never got over is just how spectacular any and every inch of beach continues to be! I love everything about this shot of Jesse Eisenberg and Kristen Stewart canoodling with a straw beach bag. Beach picnic envy for sure! And of course the film gets some great shots at swanky Mediterranean villa mansion in Beverly Hills. I love the cypress trees and beige color scheme of everyone's attire for Brunch. 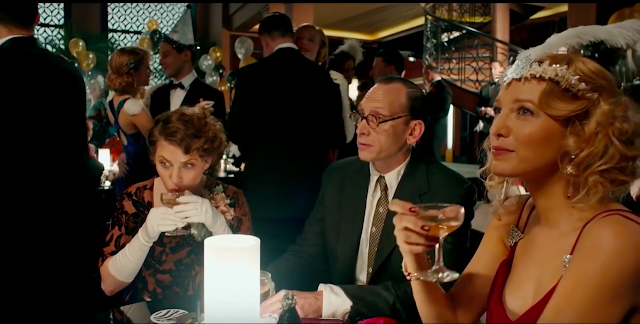 It might be hard to spot but Parker Posey (female, above) has the most wonderful silk blouse on with a giant tassel in the center that I am dying to get my hands on. Isn't it amazing how much fashion trends repeat themselves? I'm assuming costume designer, Suzy Benzinger, must have created it specifically for this film! This is perhaps one of my favorite shots in the entire film when Kristen's character comes to pick up Jesse Eisenberg for a tour of Los Angeles. The color palette cinema photographer Vittorio Storaro uses in the shots of old hollywood are so alluring and perfectly depict the relaxed vibe Los Angeles culture is so heavily attributed as. It's consistent with the costume color palate and does a great job of setting the tone for some frivolous, romantic escapades. Once again, not too far off from replicating a Slim Aarons photograph. It's a classic Los Angeles paradox to host upscale social events by the pool where nobody intends to dive in but the allure of the setting allows one misnomer the opportunity to break the insincere notion of formality and poise. Isn't that Los Angeles though in a nutshell? Always trying so hard to be taken seriously, yet in a perfect position to be pushed into the pool. And so then we go to New York, where the title of the film actually makes sense? I think the film couldn't decide between which city's past to glamorize. Fortunately for me, I happen to think they did a good job in both. I actually came to find some relevance in the switch back, where Jesse Eisenberg's character goes to Los Angeles to find adventure and in the midst, himself. Yet he ends up back in his hometown of New York City, but with an enlightened (and albeit bedazzled) sense of self, right back home. And perhaps he even finds himself more evolved as a result. They did a wonderful job of creating a great set for the club in New York City. From the champagne saucers to the broaches on Blake Lively's dress straps, all the details mattered and came together wonderfully. I must say it was quite pretty to see a little bit of Gatsby glamour in the midst of the overanalyzed comedy so much of Allen's banter is usually centered around. 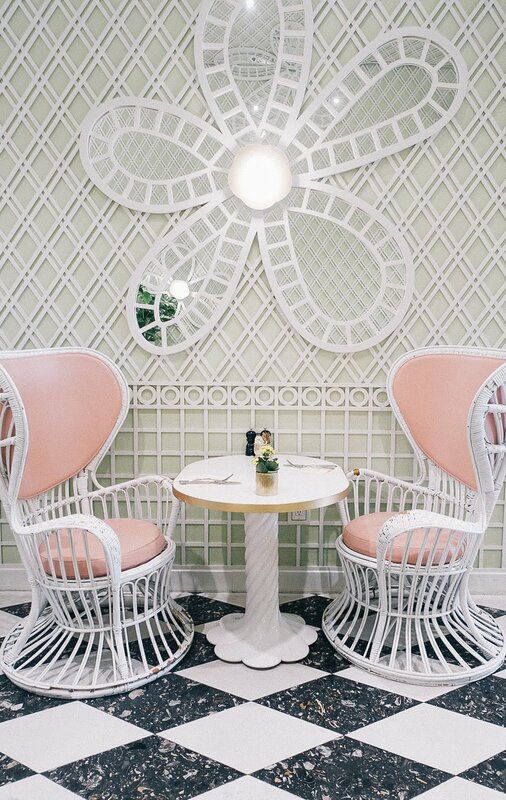 It's also a great selling point for a new bar/lounge idea in Los Angeles, the closest place I can think of is my favorite bar at Hotel Bel Air. It's even decorated with a similar color scheme and has live music at night. If only people dressed in long gloves, suits and silk gowns too! Hence the Gatsby reference... Despite my slight disappointment in some of the plot I think the film does touch on some aspects about culture and the end of life. I think what the film does do well is incorporate some aspects of how family ties continue through young adulthood and can often help and hinder growth amongst its members, both young and old. What was simple (and somewhat unexpected) was the chemistry between Kristen Stewart and Jesse Eisenberg. And what a party is was, hope you enjoyed the lovely film stills whether you make it to the theater (or maybe just Netflix, sorry, not sorry). This past weekend I had the pleasure of finding another wonderful slice of food heaven on the hippie chic Abbot Kinney in Venice. I originally came across Greenleaf's uber accessible healthy meals to go when I worked out at Equinox and they conveniently sold them at the Earthbar. I still love grabbing them for lunch at work since they are so fulfilling without feeling heavy after or falling flat on taste/heartiness. Naturally I was happy to find out a free standing restaurant opened in Hollywood and now Venice with a more extensive menu, bright and glowy ambiance, and serving delectable cocktails! Enjoy! So before I eat anywhere, I like to check out the decor scheme first and this one doesn't disappoint! I LOVE bright and airy spaces filled with tons of natural light. And I spy a banana leaf print pillow, do you? The green leaf plant with the white walls, natural light and open windows represents the way I like to see Southern California very well! First things first, delicious cocktails, juices and lattes! They have a quick to-go bar up front with grab and go meals/snacks and juices. And then this wonderful and well lit patio perfect for brunches and dinner under some pretty twinkle lights. I love the patterned tile on the floor, it just screams "I'm Instagram ready, hope your shoes are cute too." I think they did a wonderful job keeping the patio furniture in neutrals with natural wood tables, greenery and burnt orange seats. It's fitting with the causal Venice beach vibe without being overly shabby or too rustic. And now, back to the food! It's amazing to have variety. I must say my favorite menu items are the antioxidant orchard salad, wild mushroom and truffle pizza, almond crusted chicken sliders (which I ask to be put in my salad), baked sweet potato fries with an avocado pesto dip, ABC protein shake, eggs Benedict and Chinese chicken lettuce cups. It was so nice seeing friends this weekend, catching up during brunch and not feeling like I needed a nap right after! I also went back the next day to do some work over a latte on the amazing marble countertop bar. I can't wait to come back for more, perhaps a lovely dinner on that patio, until next time! More from Greenleaf Gourmet Chopshop, here.